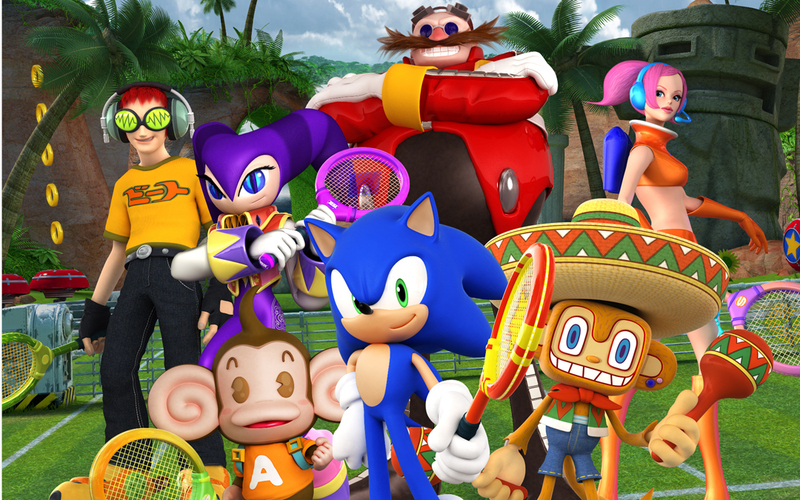 The latest tennis game is a Sega fans dream, but will it live up to the standards that fans have for it? Sega Favs: There is one huge fact that everybody must know before they play the game; SST is meant for Sega fans and Sega fans only. This game is very light on the actual tennis (strangely) and highly relies on the names in the game for success. SST features big, everyone-knows names like Sonic, Dr. Eggman, and Knuckles, as well as smaller names like the Monkey Ball-dwelling AiAi, Tails and even Sonic's stalker Amy. Sega fanboys will love these additions to the game, but the main, unbiased public won't care much about them. Unless you were playing Top Spin and found yourself wishing there were more blue hedgehogs in it, the names won't be the draw-in. Tennis, Where's The Tennis: The main "campaign" is called Superstars (hence the name) and offers a variety of character-themed "planets" that are basically just collections of mini-games that increase up in difficulty over the course of the game, usually building upon skills that you can apply to the actual tennis-playing portion of the game. Childish Games: The game plays almost exactly like Virtua Tennis 3 with shots being broken down into smashes, slices, and lobs. So the modes that try to play like real tennis are roughly realistic (minus the pink hedgehog playing tennis). In addition to that, you can choose to perform a special, character specific power move. Sadly though, the special moves don't really provide a compelling reason to play this instead of Virtua Tennis 3 and the lack of an interesting character progression system that is featured in Top Spin and Virtua Tennis 3 makes SST feel like a childish snippet of what a real tennis game is. Control Freak: The controls have been simplified a bit, and this boils the tennis experience down to a war of will where victory is decided by how long you are willing to press the volley button for. The controls are just way to simple for anyone with 10 fingers. It Takes Two To Tennis: The multiplayer aspect of the game plays fairly similar to the single player campaign, but with two players. You serve the ball, and then hit it back and forth until one of you have to go to the bathroom. The single player game is not very enjoyable, so neither is the multiplayer. Rent vs. Buy: Despite all of the bad things I've said about the game, it is still FAIRLY decent. Its not a very good game, but not excruciatingly bad either. The single player game basically boils down to a compilation of mini-games, and a little bit of tennis thrown in because of the name of the game. If you like the Sega franchise, and want something to feed your desire to see Sonic and a monkey play against each other, then pick it up, but I'm not saying that you won't be disappointed. Otherwise, rent to see if you like this type of game.